How was your weekend? I had a great time visiting the Metropolitan Museum of Art here in New York City. 🙂 There I saw about 40 Monet paintings! I like to pop in every few months and each time I make sure to drop by the Impressionist paintings. Today’s promo picture of Richard Armitage as Claude Monet comes to us from Mezz. Thank you, Mezz! To start, I applied the Artworx filter from Xero Graphics Plugins. Then I cut out Monet and applied the filter again with stronger settings to the background. Since I had cut out Monet, it was an easy task to have him pop out of the frame. I also added a drop shadow. There was plenty of room to fill in the siggie so I went on the hunt for another image and frame. 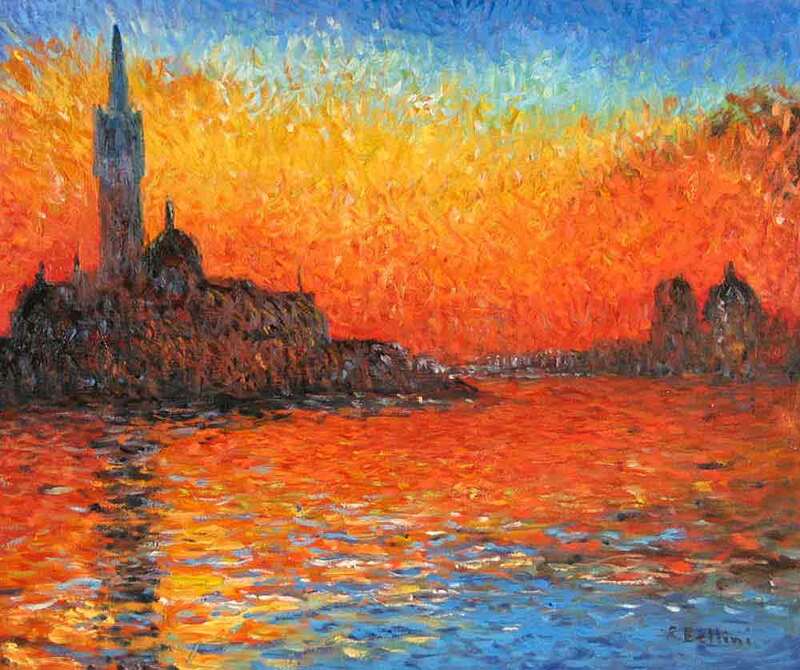 When I found “Venice Twilight” by Claude Monet, I chose it so I could have the tip of the building stick out the top of the frame. Perhaps Mezz’s music choice, Norah Jones singing “Sunrise,” had something to do with it! At the museum on Saturday, I was admiring “The Monet Family in Their Garden at Argenteuil” (1874) by Édouard Manet when I read the little plaque. I transcribed it below. In the late 1860s, Édouard Manet was Claude Monet’s hero. By 1874, they had become friends and Manet came under the sway of Monet’s approach to painting quickly, out of doors. 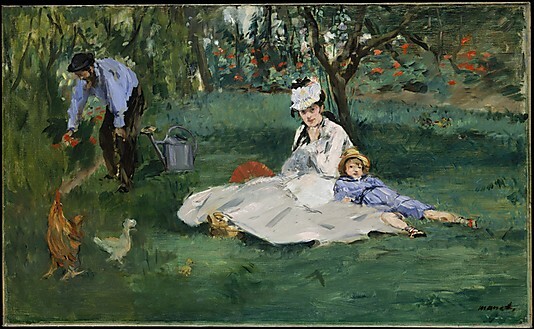 This portrait of the Monet family–Camille Monet and Jean, with Claude Monet gardening at the left–is one of Manet’s most significant essays in this new style. Renoir and Manet both gave their pictures to Monet. Renoir’s painting is now in the National Gallery of Art, Washington, D.C. If you could interview Monet, what question would you ask? This entry was posted in Collaborative Project, Graphics, richard armitage and tagged actor, camille monet, claude monet, graphic a day in may, graphics, impressionists, jean monet, monet, norah jones, richard armitage, richardarmitagenet, richardarmitagenet.com, richardarmitagenetdotcom, sunrise. Bookmark the permalink. What question would I ask Monet? Mmm, I’ll have to think about that! IMO it’s a role of Richard’s that tends to be overshadowed by Guy et al, yet in its own quieter, gentler way is just as powerful a characterisation. My question for Monet would be: If you were given the chance to paint again one and only one of your old paintings, which one would you choose and would you paint it differently? Beautiful! I would ask, if you had to choose two of your paintings to hang in your house, that you would see every day, which two would you choose? If you could choose any two of your contemporaries’ works, what would you choose? Lovely, B! Wonderful picture choice, Mezz! I like it because it looks like Richard, but not completely. You can believe he’s a young Claude Monet in this picture. If I could ask him a question? I think I’d ask if he had a favourite painting. I love the Metropolitan Museum of Art, always some new surprise to see. Obviously you used that inspiration to our benefit with today’s graphic. Question for Monet – was there someplace you wanted to go to paint and never got the chance? Can you imagine paintings of the Acropolis or the Taj Mahal made on different days and in different light? Thanks again Bcc and Mezz. I absolutely love Monet/ Renoir/Impressionists. I have always wanted to visit the Met Museum of Art and the Louvre. It is on my bucket list. This is the next best thing since we have RA too. Fabulous work as usual.And my, oh my, does he not look delicious as Monet???? Lovely! You know how much I enjoy your projects!!! How very beautiful this siggy is. Thankyou also for sharing the article about Edouard Manet’s painting of the Monet family. If there was a question I could ask Monet, it would be if he liked Richard’s portrayal of him in “The Impressionists” – and of the overall documentary. I would ask: why didn’t you destroy more of your work? (I am neutral to negative on Monet). Nice graphic, though! Just love this graphic Bccmee with Monet’s work and the great pic that Mezz selected. The Impressionist was the second time I saw Richard Armitage, after N&S. Thank you also B for the Manet story and painting. You were a revolutionary in your day, yet today your paintings can be found printed on shopping bags and all sorts of consumer items. Does this shock you or are you happy that your work is so widely known and accepted? If it were true that Monet would not have relations with Alice Hoschede until she was divorced or widowed, I’d congratualate him on his morals and ethics! Oh, now I feel like watching The Impressionists again!! Being a suspicious type when it comes to men working around the house I think I’d ask “Were you really gardening or just putting it on because you were being painted by your friends?” Lovely post Team Day 14. 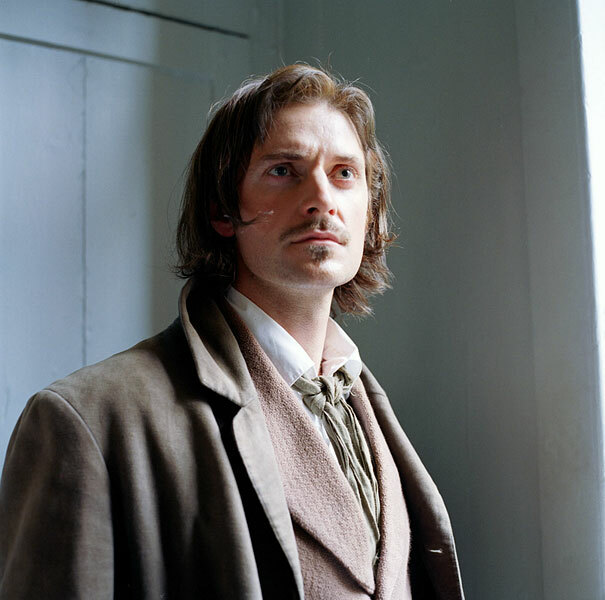 I always thought Richard was fantastic as Monet – another character that he managed to bring to life by his superb acting. Wonderful choice of picture and music, Mezz! You (and Richard!) lifted me up today just when I needed it most. I got a call this morning to say that a very dear friend has been diagnosed with terminal cancer so the base image and the lovely graphic you made from it Bcc, just warmed my heart. What would I ask Monet? I think I would ask him if he was attracted to Alice Hoschede when he first met her or did their love develop over a period of time after Camille’s death? Sorry to hear that you have had sad news about your dear friend, Teuchter. *hugs* It’s gratifying to know that Richard and I (love the sound of that!) helped in some way through Claude and Norah. “Richard and I” sounds really good, doesn’t it!! 🙂 I have to thank you Mezz! It really meant a lot to read your comment. Love the siggie, bccmee! Great choice, Mezz! Beautifully done. I’m not as familiar with Monet’s work as I am with other painters, but this makes me want to see more. The question I would ask him is if he agreed with Manet about Renoir. Lovely RA as Claude portrait and beautiful siggie! Sighhhh! I’m an impressionists fan from way back–De Gas ballerinas danced on my bedroom drapes growing up. And the Art Institute in Chicago has oodles of haystack paintings. But if I actually could ask Claude Monet a question, I would ask him about his interest in trains. Lovely to have Claude as the pic today. Great choice of pic & music Mezz! Such an interesting post today about Monet, I am another lover of the impressionists and your graphic today Bccmee is very evocative. I was lucky to be able to visit Giverny on my last trip to Europe so I would ask Monet about the design of his garden. @Everyone: Thanks for your kind words on the collaborative graphic. It’s been very fun to work with different images at a RApid clip. 😉 I’m a massive fan of Impressionism and would have loved to have met Monet. He seems like a nice guy too, unlike some artists. The fact that he was ground-breaking and changed the face of art is very fascinating to me. I hope many of you can visit the Metropolitan Museum of Art and/or The Louvre if you’ve not already done so. The garden at Giverny sounds beautiful — I’ve not visited yet! You have some very thought-provoking (and sometimes funny) questions. I now wonder the same things as many of you: What painting would you paint again? 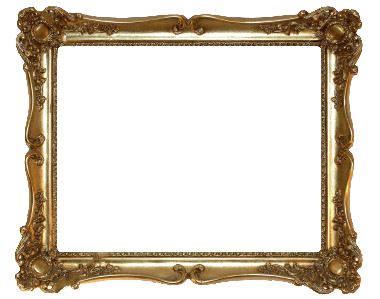 Which paintings would you choose to hang in your house? What’s your favorite painting? What location do you wish you had painted? What do you think of the documentary and RA’s portrayal of you? How do you feel about your paintings now gracing everyday items? When did you start to have feelings for Alice? Do you agree with Manet about Renoir? How did you get interested in trains? What constitutes a date? Were you really gardening or just showing off for the painting? I think I’d ask him if he drew on the walls as a child like so many children in my acquaintance, LOL! This is my favourite so far — I love that photo of RA as Monet! Of course the painting is perfect and so is everything else! C’est magnifique! Sorry I’m late in commenting, I was away for a couple of days this week so I somehow missed this post! First of all, thank you Mezz for the wonderful picture choice. I’m not familiar with Norah Jones but I quite liked this song you selected. I adore Monet and the Impressionists in general, my favourite is Renoir, and I’m really,really glad he did not give up painting! Wonder if Manet was a little jealous of Renoir? I’d ask Monet if he was ever jealous of his fellow painters, or felt inferior to any of them and whether there was a painting of another artist which he wished he’d done himself. Finally, thank you Bcc, for yet another gorgeous piece of art! You’re amazing!